Mushrooms come in many shapes and colours. In the case of green ones, which I've written about previously, a subset owe their colour not to any particular pigment they themselves produce, but rather to algae living on top of them. These algae-bearing fungi are usually polypores, otherwise known as bracket or shelf fungi. They tend to live inside dead trees, although they also be found in soil living in association with tree roots. After eating their fill of delicious wood, polypores produce shelf-like fruiting bodies with numerous pores (thus the name polypore) on their underbellies. Some of these fruiting bodies, or conks as they are also known, take on the character of the wood from which they grow. Their resilience means they can be spotted during the winter when other mushrooms have long since decayed away. 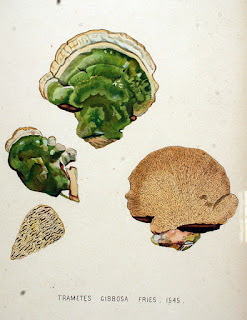 Polypores upon which algae have been spotted include species of the genera Trametes and Trichaptum, as well as Cerrena unicolor, Fomes fomentarius, Stereum subtomentosum, and Lenzites betulina (a polypore with gills instead of pores, since nature likes to defy neat categories). 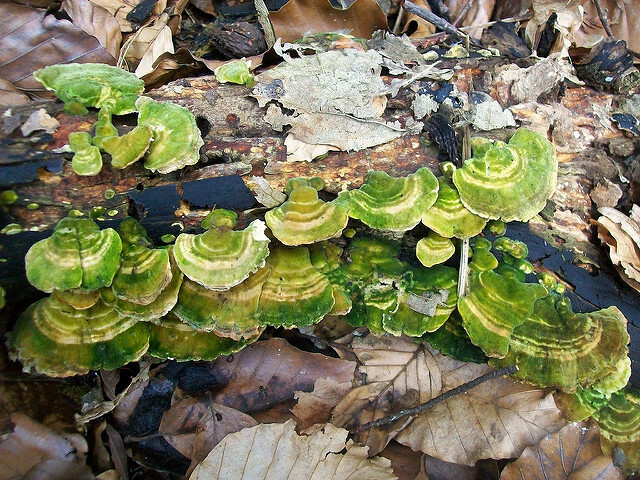 Now, the coexistence of fungi and algae is nothing new. Lichens are essentially algae (or cyanobacteria) living inside a fungus. This fungus is usually a member of the ascomycetes, one of the two major groups of mushroom-producing fungi. Polypores are members of the second group, the basidiomycetes. As is the case for lichens, the algae on top of a polypore arrangement appears to benefit both partners. The algae (usually single-celled ball-shaped green algae), being filled with green photosynthetic pigments, use sunlight to make sugars out of carbon dioxide gas. 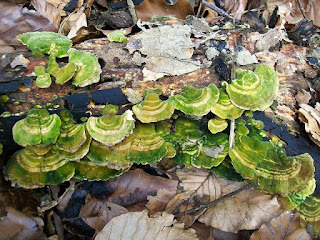 Some of these leak out and are absorbed and consumed by the fungi as an extra source of energy-rich organic carbon. The fungus, in turn, provides a solid platform upon which the algae can set up shop and grow into dense green communities. Polypore-based algae don't appear to be committed to this particular lifestyle, as they are also found in lichens (e.g. Trebouxia) or growing on plants or other sunlit surfaces. Zavada MS, Dimichele L, Toth CR. 2004. The demi-lichenization of Trametes versicolor (L.: Fries) Pilat (Polyporaceae): The transfer of fixed 14CO2 from epiphytic algae to T. versicolor. Northeastern Naturalist 11(1):33-40.